Euro Pizza Cafe, a shining star in the Fountain Hills business community, has done it again; for the sixth straight year in a row they have been named “Best Pizza in Town”, and for good reason. 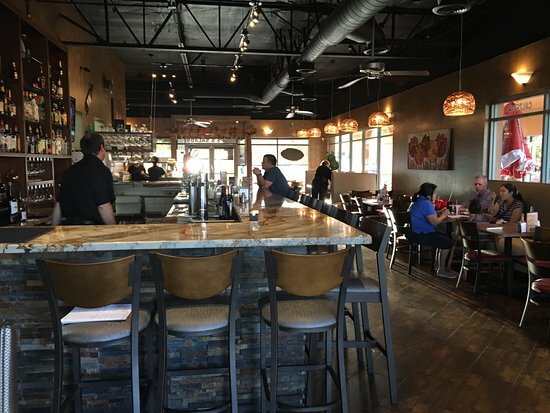 The success behind this small town business not only comes from the delicious dishes served daily from the kitchen of Euro Pizza, but also from the inoovation, new ideas, and constant evolution to bring a high quality restaurant experience here to Fountain Hills. If you look at where Euro Pizza started way back when, to what it has become today, it is evident; constantly striving to improve is a goal of the restaurant’s owner, Merita Kraya. Settling into a comfortable routine of the same menu, offerings, services and food is simply not how she does business. For instance, not only is the food part of the restaurant a huge success, Euro Pizza is tapping into the wine and beer industry and coming up with creative ways to grow that part of their business. They recently have increased their beer and wine to-go options, as well as launch a monthly “mini beer menu”. For those who are looking for a night at home, Euro Pizza also offers delivery on most of their bottles of wine and beer. Not only does Euro Pizza sell beer, they also have a beer named after them. Recently, the New Belgium “Euro Pizza Cafe Lager” was released and you can grab a pint of it in house. In addition to New Belgium, Euro Pizza also has paired up with the local establishment Bone Haus Brewery to create beer gardens, pairings with a meal, and more. You can even pick up a growler to take to your next get-together with friends! But what is a good beer with out some good food? Dining is still the main priority of Euro Pizza, and they don’t want people to forget that. Euro Pizza Cafe wants to be known as a great restaurant with a bar, not a great bar with a restaurant. Both are important for thier business, but being known as a home town favorite restaurnt is definitly what Kraya strides to have Euro Pizza known for. New to the menu are options to fit different dietary restrictions; from Gluten Free to Vegan, there is something for everyone to enjoy. Their catering business is booming, and all the time they are continuing to offer excellent service. Whether you want to bring in food for a business meeting at work or order a larger amount of food for a weekend party, Euro Pizza can handle just about any catering job you want to throw at them. No matter what the staff over at Euro Pizza is up to and currently working on, one thing is for sure; you will never be disappointed with Euro Pizza Cafe!